Magnesium gluconate is usually used as a dietary supplement for the prevention and treatment of hypomagnesemia as well as to maintain the overall quality of life. The present study was designed to evaluate the impact of The Trivedi Effect®-Energy of Consciousness Healing Treatment on the physicochemical and thermal properties of magnesium gluconate using PXRD, PSA, DSC, and TGA/DTG analysis. Magnesium gluconate was divided into two parts – one part was control (without Biofield Energy Treatment), while another part was treated with Energy of Consciousness Healing Treatment (The Trivedi Effect®) remotely by the renowned Biofield Energy Healer, Alice Branton and defined as Biofield Energy Treated sample. The PXRD analysis showed that the relative peak intensities and crystallite sizes of the characteristic diffraction peaks in the treated sample were significantly altered from -73.55% to 17.21% and from -14.28% to 125.11%, respectively compared with the control sample. The average crystallite size was significantly increased by 19.29% in the treated sample compared to the control sample. The particle size values at d10, d50, d90, and D(4, 3) of the treated sample was significantly increased by 2.03%, 70.92%, 142.25%, and 95.42%, respectively compared with the control sample. Thus, the surface area of treated sample was significantly decreased by 21.34% compared to the control sample. 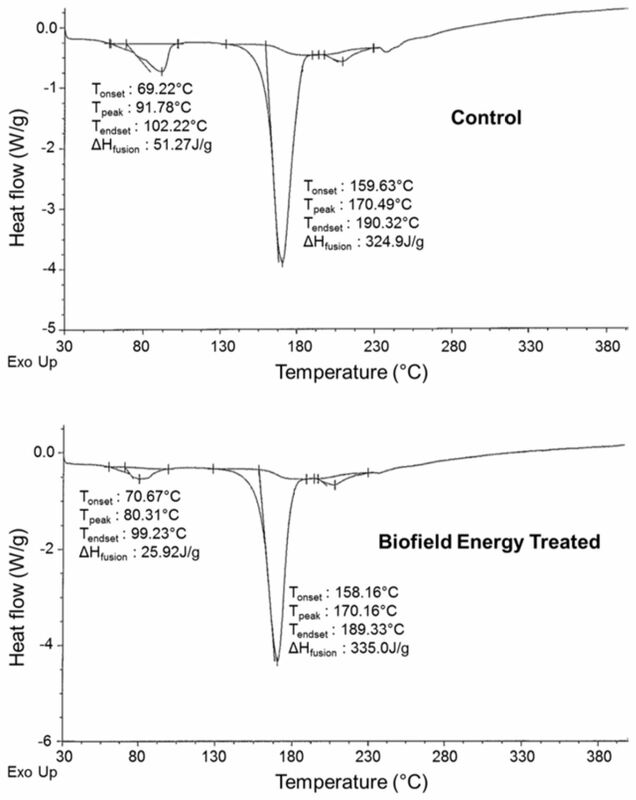 The melting point of the Biofield Energy Treated sample (170.16°C) was decreased by 0.19% compared the control sample (170.48°C). The latent heat of fusion in the treated sample was increased by 3.11% compared to the control sample. The TGA analysis exhibited three steps thermal degradation and the total weight loss of the treated sample was increased by 0.29% compared to the control sample. The maximum thermal degradation temperatures (Tmax) of the 1st and 2nd peaks were decreased by 2.86% and 1.97%, respectively, while 2nd and 3rd peaks were increased by 1.14% and 0.94% respectively, in the treated sample compared to the control sample. The thermal analysis revealed that the thermodynamic stability of the treated sample was changed compared with the control sample. The Energy of Consciousness Healing Treatment might produce a crystalline polymorphic form of magnesium gluconate, which could show better powder flowability and appearance with altered thermal stability compared to the untreated sample. Hence, Biofield Energy Treated magnesium gluconate would be advantageous in designing better nutraceutical/pharmaceutical formulations that might provide better therapeutic responses against inflammatory diseases, immunological disorders, cancer, diabetes mellitus, stress, aging, etc. Magnesium gluconate is a classical nutraceutical / pharmaceutical solid compound used for the source of magnesium, the important essential element for many enzymes, DNA, RNA and protein synthesis in the human body [1-3]. Magnesium gluconate is widely used for hypomagnesemia and for the prevention and treatment of several diseases, such as inflammatory diseases, immunological disorders, cancer, diabetes mellitus, allergies, arrhythmias, septic shock, asthma, gestational hypertension, acute myocardial infarction, preeclampsia, eclampsia, oxidative stress induced ischemia/reperfusion injury, hearing loss, etc. [4-10]. It is also used as a potent antioxidant agent, oral tocolytic agent, neuroprotective, and skin-tightening antiaging cosmetic composition [11-13]. It is a physiologically acceptable salt which provide the highest level of magnesium among the other commercially available magnesium salts [4, 5, 14]. Since from ancient times, many different cultures, religions, and systems recognized a living force that preserves and inhabits every living organism. This force is the source of ‘life’ and has been called various names, such as prana by the Hindus, ki by the Japanese, and qi or chi by the Chinese. This is believed to co-relate with the soul, spirit, and mind. This imaginary vital force has been scientifically assessed and is now considered the Bioenergetics Field. The Biofield Energy is a dynamic electromagnetic field surrounding the human body, resulting from continuous movement of the electrically charged particles (ions, cells, etc.) inside the body and it continuous discharges the electromagnetic waves in the form of bio-photons. This electromagnetic wave can freely flow between the human and environment . Thus, a human has the capability to harness energy from the “universal energy field”, and transmit it to any living organism(s) or nonliving object(s) around the globe. The object or recipient always receives the energy and responds in a useful way. This process is known as Biofield Energy Healing Treatment [16, 17]. Biofield (Putative Energy Field) based Energy Therapies are used worldwide to promote health and healing. The National Center of Complementary and Integrative Health (NCCIH) has recognized and accepted Biofield Energy Healing as a Complementary and Alternative Medicine (CAM) health care approach in addition to other therapies, medicines and practices such as natural products, yoga, Tai Chi, Qi Gong, meditation, massage, special diets, homeopathy, guided imagery, acupuncture, acupressure, hypnotherapy, movement therapy, pilates, mindfulness, rolfing structural integration, Ayurvedic medicine, traditional Chinese medicines, naturopathy, essential oils, aromatherapy, Reiki, healing touch, cranial sacral therapy, applied prayer, etc. . The Trivedi Effect® has gained the importance in several fields include material science [19, 20], organic compounds [21, 22], agricultural [23, 24], microbiology [25, 26], pharmaceuticals [27, 28], nutraceuticals , biotechnology [30, 31], genetics [32, 33], medical  due to its astounding ability to alter the characteristic properties of the non-living and living objects. Scientific literature reported that The Trivedi Effect® - Energy of Consciousness Healing Treatment has the astounding capability to alter physicochemical properties such as crystalline structure, crystallite size, particle size, surface area, and thermal stability of magnesium gluconate after treatment with different healers [35, 36]. Hence, the current study was design to evaluate the impact of The Trivedi Effect® - Consciousness Energy Healing Treatment by Alice Branton on the physico-chemical, and thermal properties of magnesium gluconate using various analytical techniques include powder X-ray diffraction (PXRD), particle size analysis (PSA), differential scanning calorimetry (DSC), and thermogravimetric analysis (TGA) analysis. Magnesium (II) gluconate hydrate was procured from Tokyo Chemical Industry Co., Ltd., Japan. All other chemicals used in the experiment were of analytical grade available in India. The test compound, magnesium gluconate was divided into two parts. One part of the test compound did not receive the Biofield Energy Treatment and was considered as untreated or control magnesium gluconate. The second part of the test compound received the Energy of Consciousness Healing Treatment by the renowned Biofield Energy Healer, Alice Branton (USA), and designated as the Biofield Energy Treated magnesium gluconate. The Trivedi Effect® - Energy of Consciousness Healing Treatment was provided for 3 minutes through the Healer’s Unique Energy Transmission process remotely to the test compound, which was kept under laboratory conditions. Similarly, the control compound was subjected to “sham” healer under the similar laboratory conditions. The sham healer did not have any knowledge about the Biofield Energy Treatment. After that, the Biofield Energy Treated and untreated samples were kept in similar sealed conditions and characterized using PXRD, PSA, DSC, and TGA techniques. The particle size analysis of magnesium gluconate was conducted on Malvern Mastersizer 3000, UK with a detection range between 0.01 µm to 3000 µm using wet method [35-36]. The sample unit (Hydro MV) was filled with a dispersant medium (Light liquid paraffin oil) and operated the stirrer at 2500 rpm. Refractive index values for dispersant and samples were 0.0 and 1.47. The measurement was taken twice after reaching obscuration in between 10% and 20%, and the average was taken of two measurements. Consequently, PSA analysis of magnesium gluconate was repeated for three times to obtain the average particle size distribution. d10 µm, d50 µm, d90 µm represent particle diameter corresponding to 10%, 50%, and 90% of the cumulative distribution. D(4, 3) represents the average mass-volume diameter and specific surface area (SSA, m2/Kg). The calculations were done by using software Mastersizer V3.50. Where, SControl and STreated are the surface area of the control and Biofield Energy Treated magnesium gluconate, respectively. Where, ∆HControl and ∆HTreated are the latent heat of fusion of the control and treated magnesium gluconate, respectively. Where, WControl and WTreated are the weight loss of the control and Biofield Energy Treated magnesium gluconate, respectively. Where, MControl and MTreated are the Tmax values of the control and Biofield Energy Treated ferrous sulphate, respectively. The PXRD diffractograms of both the control and Biofield Energy Treated magnesium gluconate exhibited sharp and intense peaks (Figure 1) indicating that both the samples were crystalline in nature. PXRD data such as the Bragg angle (2θ), relative intensity (%), and crystallite size (G) for the control and Biofield Energy Treated magnesium gluconate are presented in Table 1. The highest intense peak (100% relative intensity) in the control and Biofield Energy Treated samples was observed at Bragg’s angle (2θ) equal to 19.0° and 5.1°, respectively (Table 1, entry 1 and 10). Table 1 showed that Bragg’s angle (2θ) of both the samples remained almost same in other PXRD peaks, but the relative intensities of the peaks of the Biofield Energy Treated sample was found different from the control sample. Thus, relative peak intensities of the Biofield Energy Treated magnesium gluconate was significantly altered in the range of -73.55% to 17.21%. However, the overall intensity of characteristic diffraction peaks weakened after the Alice’s Biofield Energy Treatment. The crystallite sizes of the control and Biofield Energy Treated magnesium gluconate at position 2θ equal to nearly 10.70°, 13.9°, 20.1°, 20.9°, 22.4°, and 40.4° (Table 1, entry 3, 4, 12, 14, 15, and 26) remained unchanged. But, the crystallite size values of the Biofield Energy Treated sample at 2θ equal to nearly 15.3°, 15.8°, 16.4°, 17.9°, 18.5°, 19.0°, 19.8°, 20.4°, 23.6°, 24.7°, 27.04°, 29.0°, 31.4°, 32.5°, and 39.6° (Table 1, entry 5-11, 13, 16, 17, 19, 20, 22, 23, and 25) were significantly increased from 10.01% to 125.11% with respect to the control sample. 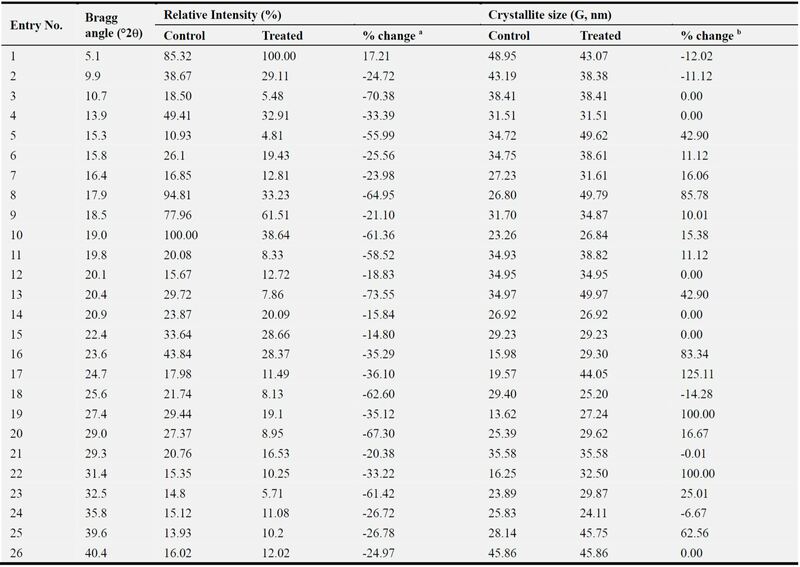 Consequently, the crystallite sizes of the Biofield Energy Treated sample at 2θ equal to 5.1°, 9.9°, 25.6°, and 35.8° (Table 1, entry 1, 2, 18, and 24) were significantly decreased from 6.67% to 14.28% compared to the control sample. The average crystallite size of the Biofield Energy Treated magnesium gluconate was significantly increased by 19.29% compared with the control sample. As per the literature, the changes in the PXRD patterns such as crystallite size and relative intensities, indicated the modification of the morphology of the crystal as well as the proof of polymorphic transition [38-40]. As the crystallite size of the Biofield Energy Treated sample was significantly altered compared with the control sample, which might produce a new polymorphic form of magnesium gluconate. Polymorphic forms of pharmaceutical solids have the significant impact on the drug performance, such as bioavailability, therapeutic efficacy, and toxicity, because their thermodynamic and physicochemical properties like melting point, energy, stability, and especially solubility, are different (probably improvement) from the original form [39, 40]. Thus, it can be anticipated that Alice’s Biofield Energy Treatment could be a very useful approach for the production of novel crystal polymorph of magnesium gluconate that would provide an improvement on its therapeutic performance . adenotes the percentage change in the relative intensity of Biofield Energy Treated sample with respect to the control sample; bdenotes the percentage change in the crystallite size of Biofield Energy Treated sample with respect to the control sample. The particle size and surface area of the control and Biofield Energy Treated magnesium gluconate was calculated and presented in Table 2. The particle size distribution of the control sample was observed at d10 (10.83 µm), d50 (25.34 µm), d90 (79.29 µm), and D(4, 3) (38.86 µm). 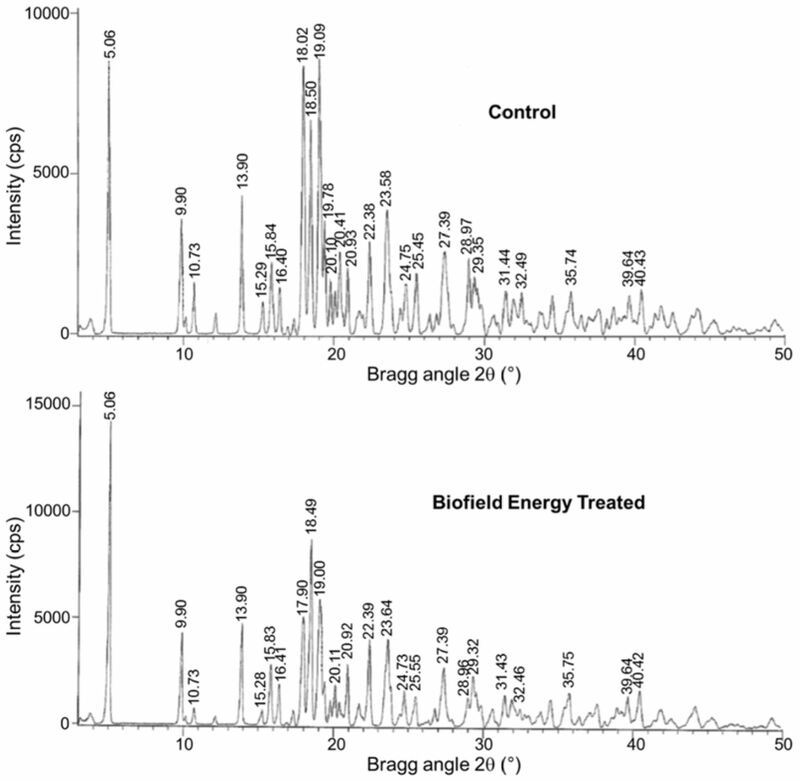 Consequently, the particle size distribution of the Biofield Energy Treated sample was found at d10 (11.05 µm), d50 (43.31 µm), d90 (192.08 µm), and D(4, 3) (75.94 µm). The particle size values at d10, d50, d90, and D(4, 3) in Alice’s Biofield Energy Treated magnesium gluconate was significantly increased by 2.03%, 70.92%, 142.25%, and 95.42%, respectively compared with the control sample. Therefore, the specific surface area (SSA) of Biofield Energy Treated magnesium gluconate (268.00 m2/Kg) was significantly decreased by 21.34% with respect to the control sample (210.80 m2/Kg). Table 2. Particle size distribution of the control and Biofield Energy Treated magnesium gluconate. d10, d50, and d90: particle diameter corresponding to 10%, 50%, and 90% of the cumulative distribution, D(4, 3): the average mass-volume diameter, and SSA: the specific surface area; *denotes the percentage change in the Particle size distribution of the Biofield Energy Treated sample with respect to the control sample. The particle size and surface area of a pharmaceutical solid compound play a vital role in the solubility, absorption, dissolution rate and bioavailability [42, 43]. The introduction of the Biofield Energy leads to the transform the fine particles into larger particles. The increased the particle size may enhance the flowability with improved product shape and appearance [44, 45]. It is assumed that The Trivedi Effect® - Energy of Consciousness Healing Treatment might improve the flowability, shape, and appearance of magnesium gluconate. The DSC thermograms of the control and Biofield Energy Treated magnesium gluconate (Figure 2) exhibited two endothermic peaks. The first endothermic peak (minor) was due to the evaporation of the water from the sample. Figure 2. DSC thermograms of the control and Biofield Energy Treated magnesium gluconate. Table 3. The latent heat of fusion (J/G) and melting point (°C) values of the control and Biofield Energy Treated magnesium gluconate. ∆Hfusion: Latent heat of fusion; *denotes the percentage change of the Biofield Energy Treated sample with respect to the control sample. The second sharp endothermic peak (major) was due to the melting temperature of the magnesium gluconate (Figure 2). The vaporization temperature and latent heat of vaporization were significantly decrease by 12.50% and 49.44%, respectively (Table 3). The melting temperature of the Biofield Energy Treated magnesium gluconate (170.48ºC) was almost closer the control sample (170.16ºC), but the latent heat of fusion (∆Hfusion) in the Biofield Energy Treated magnesium gluconate was increased by 3.11% compared to the control sample (Table 3). An increment in the particle size increases the melting point and latent heat of fusion . The DSC results were well supported by the particle size data and suggested that the thermal stability of Alice’s Biofield Energy Treated magnesium gluconate was increased compared with the control sample. The TGA study of the control and the Biofield Energy Treated magnesium gluconate exhibited three thermal degradation steps (Figure 3), and the data are presented in Table 4. 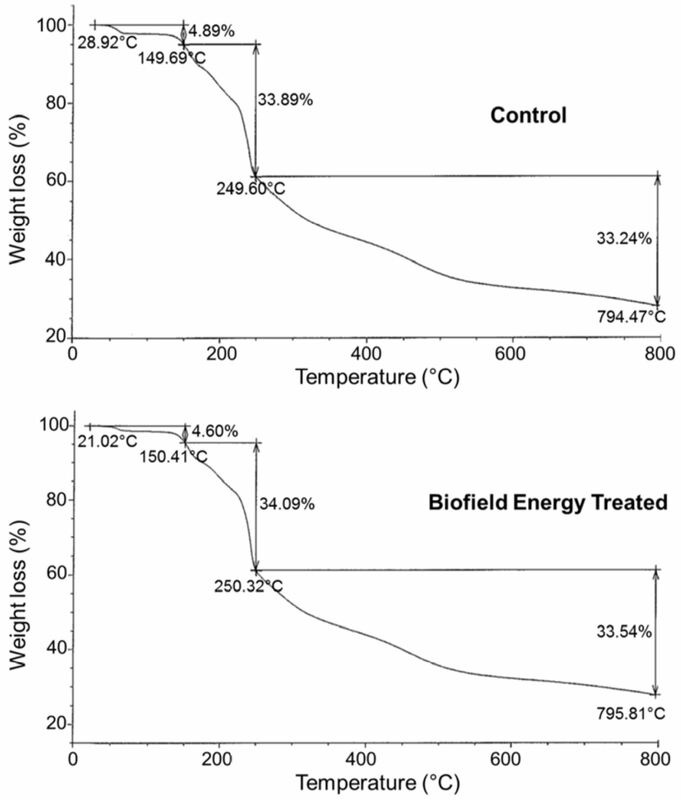 The weight loss of the Biofield Energy Treated sample at the 1st steps of thermal degradation was decreased by 5.93% compared to the control sample. Whereas, the weight loss of the Biofield Energy Treated magnesium gluconate at the 2nd and 3rd steps of degradation were increased by 0.59% and 0.90% compared to the control sample. The total weight loss of the Biofield Energy Treated sample was very close and increased by 0.29% compared with the control sample (Table 4). Figure 3. The TGA thermograms of the control and Biofield Energy Treated magnesium gluconate. Table 4. The TGA thermal degradation steps of the control and Biofield Energy Treated magnesium gluconate. The DTG thermograms of the control and Biofield Energy Treated samples (Figure 4) exhibited four peaks. 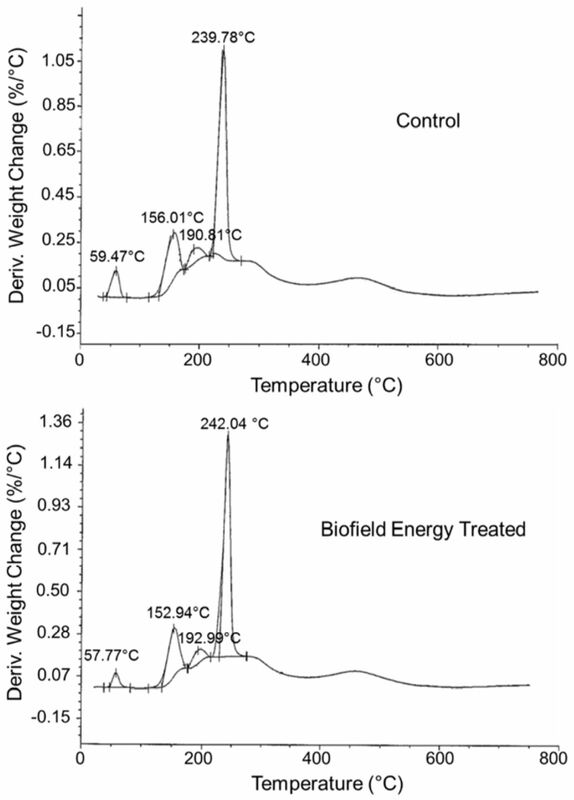 The maximum thermal degradation temperature (Tmax) of 1st and 2nd peaks of the Biofield Energy Treated sample were decreased by 2.86% and 1.97%, respectively compared to the control sample (Table 5). The Tmax of 3rd and 4th peaks in the Biofield Energy Treated sample were increased by 1.14% and 0.94%, respectively compare to the control sample (Table 5). Overall, TGA/DTG revealed that the thermal stability of the Alice’s Biofield Energy Treated magnesium gluconate was altered compared to the control sample. Figure 4. The DTG thermograms of the control and Biofield Energy Treated magnesium gluconate. Table 5. The DTG thermal degradation steps of the control and Biofield Energy Treated magnesium gluconate. *denotes the percentage change in the weight loss of the Biofield Energy Treated sample with respect to the control sample, Tmax = the temperature at which maximum weight loss takes place in TG or peak temperature in DTA. The Trivedi Effect® - Energy of Consciousness Healing Treatment exhibited significant effects on the physicochemical and thermal properties of magnesium gluconate. The sharp and intense peaks in the PXRD diffractograms of the control and treated magnesium gluconate revealed that both the samples were crystalline in nature. The relative peak intensities of the characteristic diffraction peaks in the treated sample were significantly altered from -73.55% to 17.21%. Similarly, the crystallite size of the characteristic diffraction peaks in the treated sample was significantly altered from -14.28% to 125.11% compared to the control sample. The average crystallite size was significantly increased by 19.29% in the treated sample compared with the control sample. The particle size values at d10, d50, d90, and D(4, 3) in Alice’s treated magnesium gluconate was significantly increased by 2.03%, 70.92%, 142.25%, and 95.42%, respectively compared with the control sample. The surface area of treated magnesium gluconate was significantly decreased by 21.34% with respect to the control sample. The melting point of the Biofield Energy Treated sample (170.16°C) was lowered by 0.19% compared the control sample (170.48°C). The latent heat of fusion in the Biofield Energy treated magnesium gluconate was increased by 3.11% compared to the control sample. The TGA analysis exhibited three steps thermal degradation in both samples. The total weight loss of the treated sample was increased by 0.29% to the control sample. The maximum thermal degradation temperatures (Tmax) of the first two peaks were decreased by 2.86% and 1.97%, respectively, while 2nd and 3rd peaks were increased by 1.14% and 0.94%, respectively in the treated sample compared to the control sample. The DSC and TGA/DTG analysis revealed that the thermal stability of the treated sample was altered compared with the control sample. The Energy of Consciousness Healing Treatment might produce a polymorphic form of magnesium gluconate, which could show better powder flowability and appearance with altered thermal stability compared to the untreated sample. Thus, The Alice’s Energy of Consciousness Healing Treated magnesium gluconate would be very useful to design better nutraceutical and pharmaceutical formulations for the treatment of cancer, diabetes mellitus, allergies, septic shock, inflammatory diseases, immunological disorders, asthma, arrhythmias, acute myocardial infarction, gestational hypertension, preeclampsia, eclampsia, hearing loss, oxidative stress induced ischemia/reperfusion injury, etc. Trivedi MK, Branton A, Trivedi D, Nayak G, Wellborn BD, Smith DL, Koster DA, Patric E, Singh J, Vagt KS, Callas KJ, Panda P, Sethi KK, Jana S (2017) Characterization of physicochemical, thermal, structural, and behavioral properties of magnesium gluconate after treatment with the Energy of Consciousness. International Journal of Pharmacy and Chemistry 3: 1-12.